Discussion in 'Calibration, Help, and Troubleshooting' started by Kiwimaddog, Mar 20, 2016. I get to about layer 10, then there is a thermal runaway-error. What exactly does this mean? Is there a clear definition of this error? My understanding it "thermal runaway" is when Marlin thinks the temperature readings no longer fit with what it expects given the amount of heat it's applying to the block. So if it's heating but the block is cooling it thinks "uh oh" and cuts out. Yes, this is a protection built into the firmware, if the system detects it has sent power to heat the extruder and it hasn't heated up enough this is a fail safe. It was built to cover the instance of the sensor falling off or disconnecting and the heater kept heating up and running away. Printers have melted themselves this way from too much heat! The issue with the bigbox is the fans are too good! Because they are cooling so well the printer thinks it's not heated up enough. 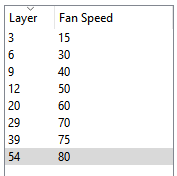 Two solutions, first the fans on the side of the extruders need to be as low as possible, also I set my max fan speed to 60% for pla which helps as well. I agree with Pierce. The standard Benchy script defaults to 100% fan speed at a certain layer height (you can hear the fans speeding up when this happens). When you are quick enough you can manually lower the speed before the thermal runaway kicks in. Tune your PID, this might be enough, and I'd recommend this anyway. Reslice with a less agressive fan profile. Thank you very much for the answers, I believe I have enough understanding of this phenomenon now to remedy it. Greatly appreciated. While I'm on this subject. Regarding the PID-tuning. I do not have the OctoPi so.. Is there another way of sending commands to the Marlin, ie via Repetier or some such? (When I tried to just plain connect via USB I was not able to send any commands[Repetier Host]). I noticed that RichRap has wrapped his hot end with Kapton tape to protect it from the fan blast. I have used a strip of fibre glass mat to achieve the same thing but on a larger hot end. A new PID may have to be run to compensate but I did not need to do that. Under the "Manual Control" section of Repetier you can send commands with the Gcode dialogue box + send. @mike01hu Hi. Yes, this is the procedure I'm used to and the way I usually send commands to my printer, Only this time the commands only cue up and I can't seem to get any response from the Marlin. Do you mean that you have gotten it to work with Repetier host? I have not tried this with BB as I am still waiting for mine but it does work with my current printer. If you cannot control the printer from the "Manual Control" screen, you are not connected correctly so check your settings. To answer the question on thermal runaway. The theory is that if a thermistor should come loose from the heater block the temperature will start to drop. When this happens the system will try and ramp up the heater power to "bring it back to temp" eventually heating to the point of dangerous temperatures. Same can hold true if the heater circuit gets stuck open (for whatever reason). It looks for a range of drop over a certain time. Running the PID tuning at a higher temp (say 280) will help to have better response at lower temperatures. Ok, so for the next step. Is there a way/method to run the PID-tuning and recieve the feedback without the OctoPI/RPi?